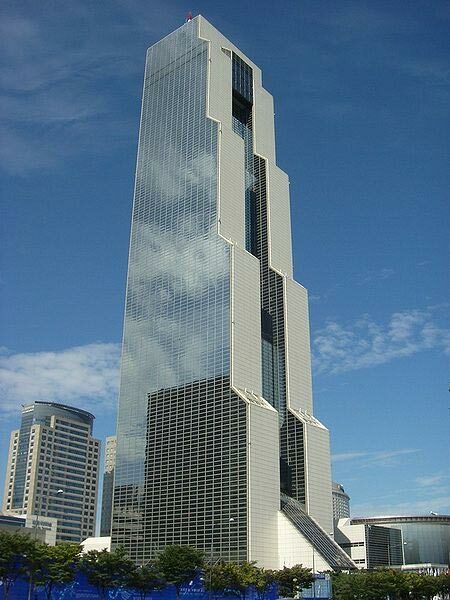 Are you interested in doing business in South Korea? Are you interested in taking a trip to South Korea? 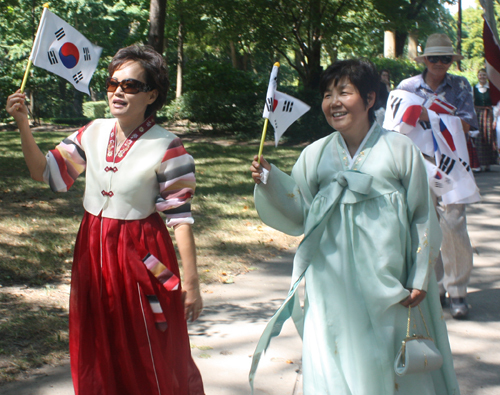 Are you of Korean heritage and living, working or visiting Cleveland or Northeast Ohio? 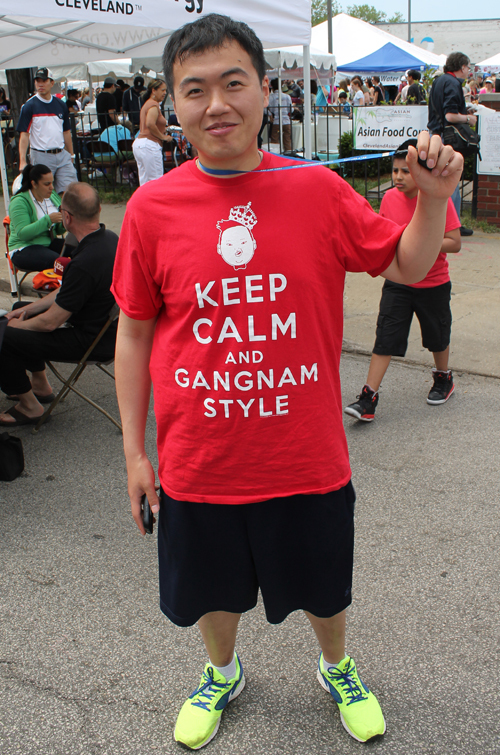 Submit your Cleveland Korean news and events. 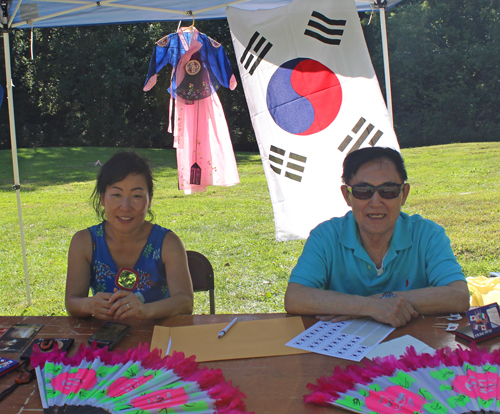 The Cleveland Korean community was out at the 73rd annual One World Day on the future site of the Korean Cultural Garden and shared their culture with thousands of visitors on One World Day. HyunJin Oh, Umgie Oh and Kate Oh represented Korea. The clothing they are wearing is called "Hanbok". It is characterized by vibrant colors and simple lines without pockets. 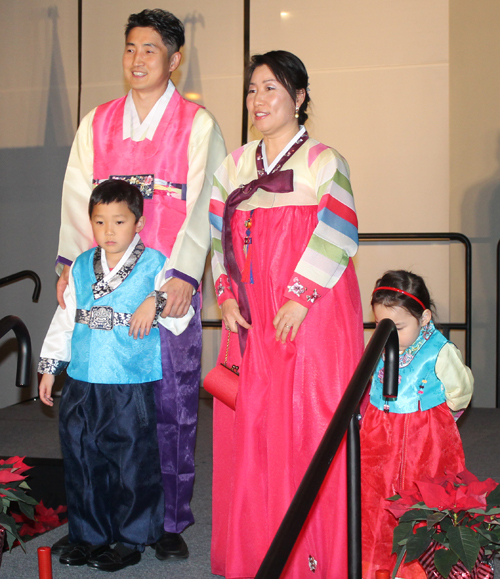 Although the term literally means "Korean clothing", Hanbok usually refers specifically to clothing of the Joseon period (beginning term of Korean History) and is worn as semi-formal or formal wear during traditional festivals and celebrations such as Thanksgiving and New Year's Day. Asian Services In Action, Inc. (ASIA, Inc.) is the largest Asian American & Pacific Islander-focused (AAPI) health and social service 501(c)(3) agency in the State of Ohio. For more than 20 years, they have taken on the most challenging tasks to help the underserved, low-income, and immigrant communities in Northeast Ohio and all across the state. Serving over 28,000 individuals and families annual, ASIA is committed to the AAPI community through the various health and social service programs they offered. 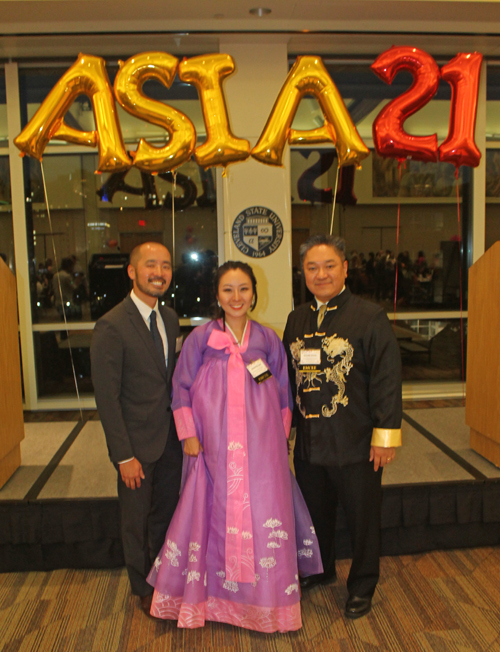 On October 20, 2017 ASIA, Inc. held their 21st Anniversary Gala and Fundraiser at Cleveland State University. International students from around the world who are attending school in Cleveland attended InterCLE 2017, a grand welcome for international students hosted by Global Cleveland and Friends of Global Cleveland a new, international young professionals group and with the support of the City of Cleveland. 4 young ladies entertained with some K-Pop. 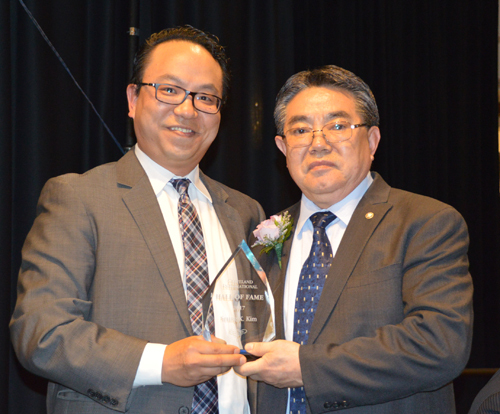 Seung K Kim, who was born in Kimhea, South Korea, was inducted into the Cleveland International Hall of Fame in front of 500 attendees on April 18, 2017. 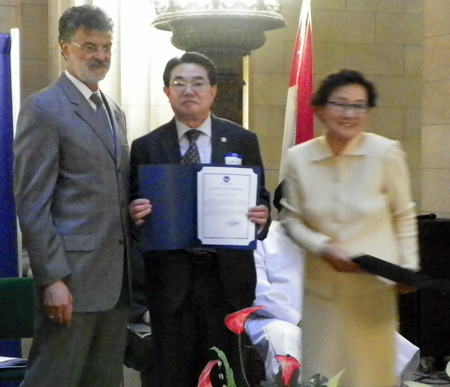 He is the first person of Korean heritage to be inducted. 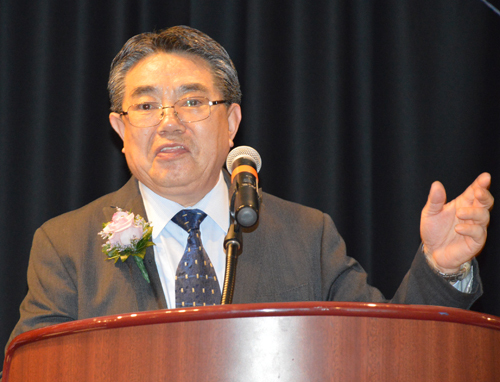 Sam was inducted by his son Ki Kim. Click on the white arrow in the image below to watch the video of Sam's sppech. Make sure your speakers are on and you can make the video full screen once it begins by clicking the icon in the lower right corner. Margaret Wong and Associates and Case Western Reserve University joined together to create an evening reception to promote health, education, and awareness to the Asian community in Cleveland. 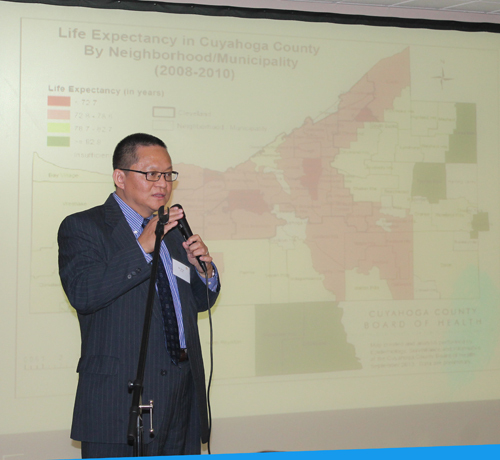 The event featured an educational seminar by Li Li, MD PhD, Mary Ann Swetland Center for Environmental Health at Case Western Reserve University School of Medicine Professor and Director. Dr. Li spoke about Acculturation and Health Disparities in Asian Population. Rose Wong founded Pearl of the Orient restaurant in 1978. It was the first to offer Northern and Szechuan cuisine in Cleveland Ohio and continues to be a favorite among Chinese food cognoscenti. 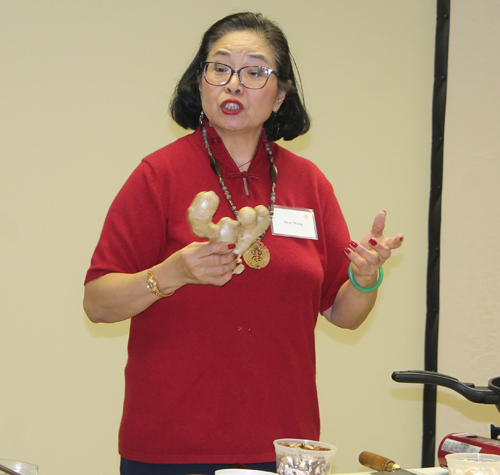 Rose created two healthy dishes and answered questions about woks, soy sauce, MSG and more. 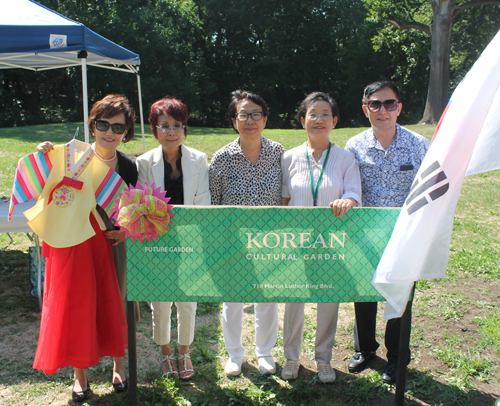 Plans are in the works for a Korean Cultural Garden in the chain of Cleveland Cultural Gardens. 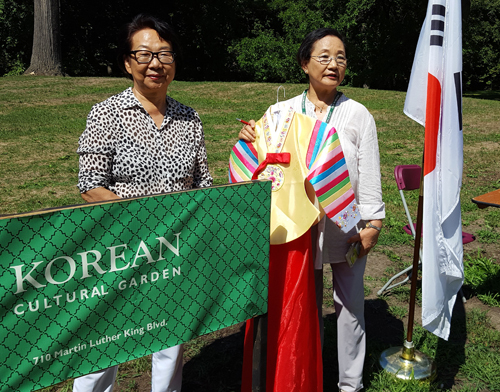 Members of the Korean Garden team took part in the 71st annual One World Day in the Centennial Year of the Gardens. 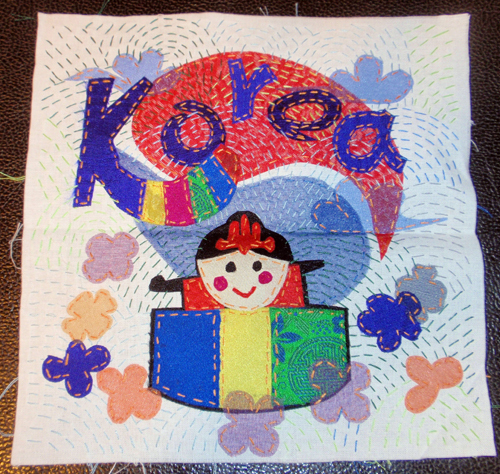 The Cleveland Korean Community, under the leadership of Hyeon Susan Harris, is participating in the ClevelandPeople.Com International Quilt project. This is the square they submitted for the quilt. Susan writes "We have chosen a happy Korean bride and called it "Assie." Her wedding day is the happiest day of her life. She wears the most colorful wedding dress. The color of the bride's dress is red, green, blue and yellow on a Hanbok (traditional Korean dress). It symbolizes 'happy' and the most beautiful day should be your wedding day." The Cleveland Food Adventurers Passport event in September 2015 was at the Korea House Restaurant at 37th and Superior in Cleveland. 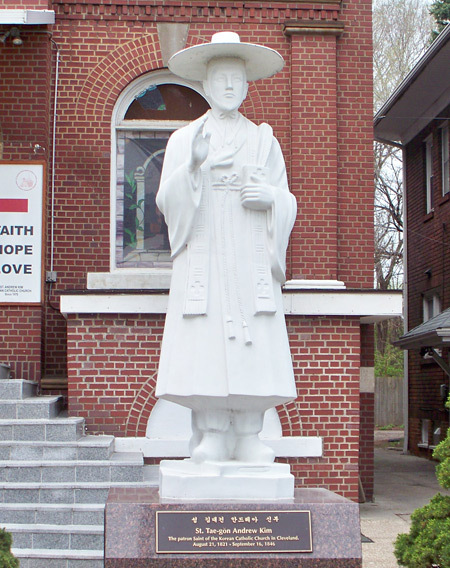 The Korea House has been in Cleveland for more than 30 years. Sean, son of the owner, served as our host. People who enjoy trying different foods and learning about different cultures participate in the Food Adventurer's group. The first 50 Passport holders who RSVP'd enjoyed a sumptuous Korean meal and learned about the country, culture, customs and, of course, food of Korea. Dan Hanson of ClevelandPeople.Com spoke at the Cleveland Food Adventurers Passport event at the Korea House. Dan told how Korean babies are 1 year old on their birthday and that everyone celebrates their birthday on New Year's. He also said there are 3 main family names in Korea (Kim, Park and Lee) and that in Korea the family name usually comes first, like Choo Shin-soo but we westernize it to Chin-soo Choo. He said there are 3 ways to say hello depending on the relationship with the person and also how to show respect to an elder. Dan Hanson of ClevelandPeople.Com spoke at the Cleveland Food Adventurers Passport event at the Korea House. He spoke about the Korean wave in pop culture and K-Pop. He said that Gangnam Style was the first billion view video on YouTube and then explained what Gangnam style means. Then part of the song was splayed and Sean and others danced. Lt Colonel Joseph Meissner spoke at the Cleveland Food Adventurers Passport event at the Korea House. He told about the Turtle ships, the first iron clad ships in the world. Admiral Yi Sun-sin designed the ship and they participated in the war against Japanese naval forces supporting Toyotomi Hideyoshi's attempts to conquer Korea from 1592-1598. Gia Hoa Ryan is from Vietnam and runs the Saigon Plaza restaurant in Cleveland's West side. Ms. Ryan told about her visit to the Kimchi Museum in Seoul South Korea. 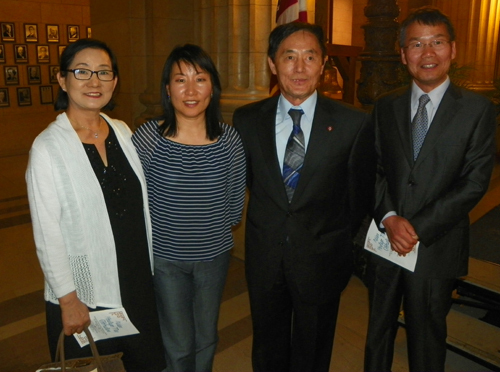 Susan is Secretary of the Korean American Association of Greater Cleveland. She wore and spoke about a Korean Traditional Ladies Dress and explained how the colors mean things - such as marital status. 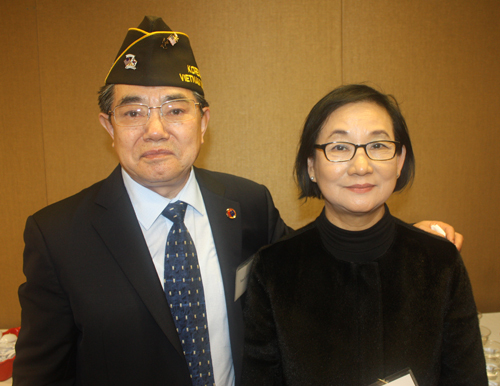 The Korean American Association of Greater Cleveland gathered at the Louis Stokes Cleveland VA Medical Center to honor veterans of the Korean War. 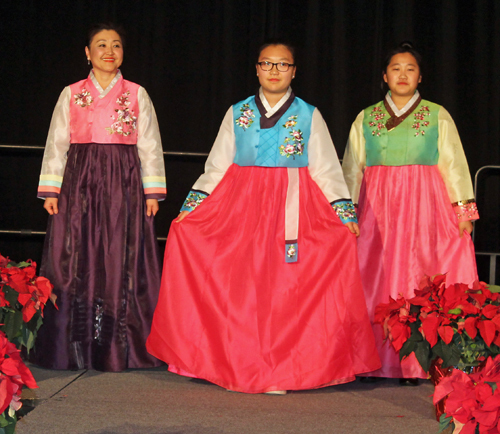 They were joined by the Federation of Midwest Korean-American Associations, the National Unification Advisory Council, the Republic of Korea in Chicago as well as the City of Cleveland Ohio. 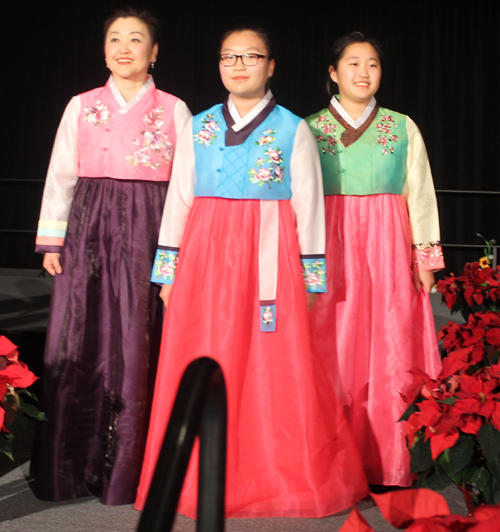 Representatives from the Cleveland Korean community participated in the International Community Council - Worldwide Intercultural Network's (ICC-WIN) 5th annual multicultural holiday celebration at the Global Center for Health Innovation in the Cleveland Convention Center in Cleveland Ohio. They modeled Korean costumes at the International Fashion Show which featured traditional costumes of dozens of countries. 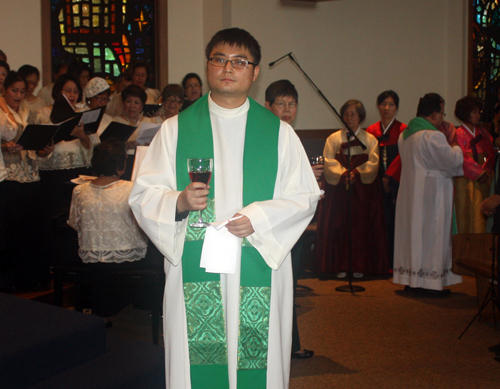 The Cleveland Asian Catholic community gathered at the 16th annual Asian Mass of the Diocese of Cleveland which took place on Sunday October 5, 2014 at St. Clarence Church. The second reading (from St Paul's letter to the Philippians) was read in Korean. Dance performance video of Korean children from St. Andrew Kim Church. About 1000 people celebrated the Annual Mass and Gathering on Sunday, October 5, 2014 at 12 noon at St. Clarence Church. 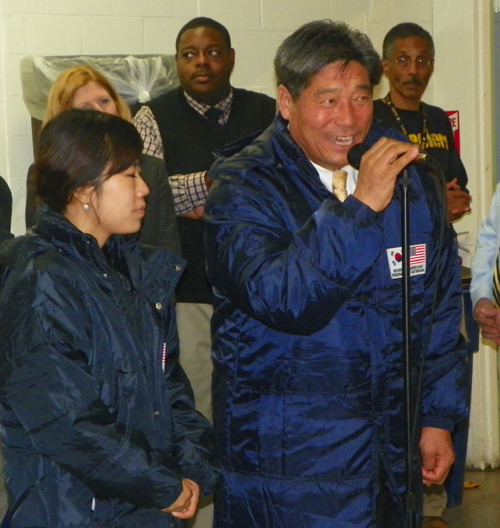 This is the 17th year the event was hosted by the Asian Ministry of the Diocese of Cleveland. It was an afternoon of family celebration of Asian culture and spirituality beginning with the celebration of the Mass with the Most Rev. Roger W Gries, OSB along with priests from the different Asian Catholic communities. The cultural and ethnic diversity of the Asian Catholic communities assembled at the Mass was reflected throughout the celebration. Members of the various Asian communities came together with their own traditions, dressed in colorful ethnic clothes: shimmering saris, kimonos, karawangs, hanboks, barongs, and ao dai. The entrance procession included Vietnamese drums. During the Mass there was an incense ceremony by the Vietnamese, and the Indian aarti. Hymns were sung by the choirs in various Asian languages: Tagalog (Filipino), Korean, Vietnamese and Hindi (Indian). The readings and the prayers of the faithful were also said in various Asian languages. Chuseok or Korean Thanksgiving Festival, also known as Hangawi, is one of the most important festivals in Korea. It is also known as harvest festival which is held around the Autumn Equinox. People in Korea celebrate the festival as a three-day-holidays starting from the day before until the day after Chuseok. In this short video, Min Woo Nam from the Seoul Garden in Parma (Cleveland) Ohio explained the Korean holiday of Chuseok which is like Thanksgiving. It is one of the 2 major holidays celebrated in Korea that brings the entire family together. The other is the Lunar New Year in January or February. The family gives thanks for the food that their ancestors gave them. They eat foods such as songpyeon which is a Korean traditional rice cake which contains stuffing of sesame seeds, black beans and other ingredients. In this other video Min Woo Nam explained some traditional Korean foods such as kimchi (kimchee) and soups, bean paste, short ribs and others. 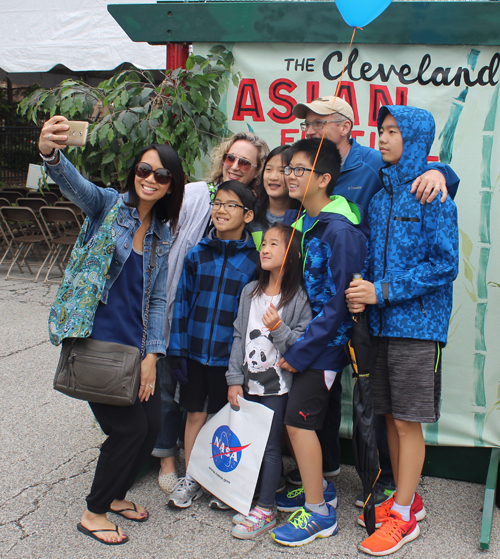 The 4th annual Cleveland Asian Festival attracted 38,380 attendees over the weekend of May 18-19, 2013. They spent over $2 million in the AsiaTown neighborhood. There were dozens of performances from local, regional, and national performing groups including headliner Cheesa from NBC's The Voice. People enjoyed Asian cuisine from over 20 different restaurants and shopping in the World Market which was filled with merchants of Asian themed products while sponsors had informational displays at their tent. 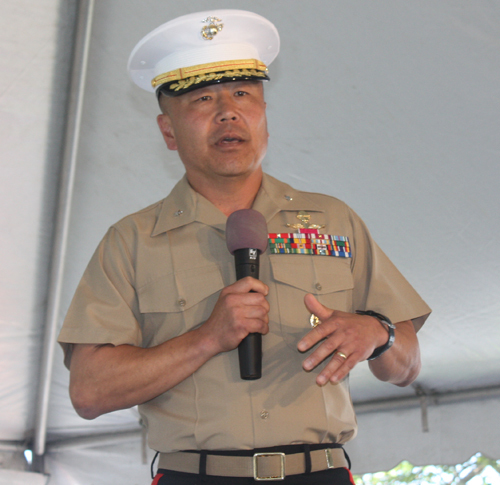 A highlight of the first day of the 2012 Cleveland Asian Festival was a speech by Korean-American Marine Brigadier General Daniel D. Yoo. Brigadier General Daniel D. Yoo spoke about the contributions of Asian-Americans in the Marine Corps and other services and singled out 3 Asian-American military heroes. 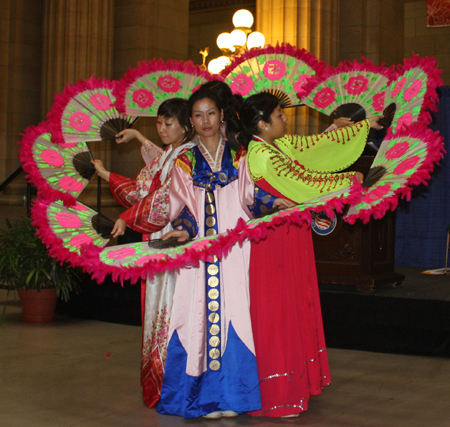 A diverse group of Asian Americans (Korean, Chinese, Vietnamese, Indian and others) gathered in the Rotunda of Cleveland City Hall to celebrate Asian Pacific American Heritage Day. 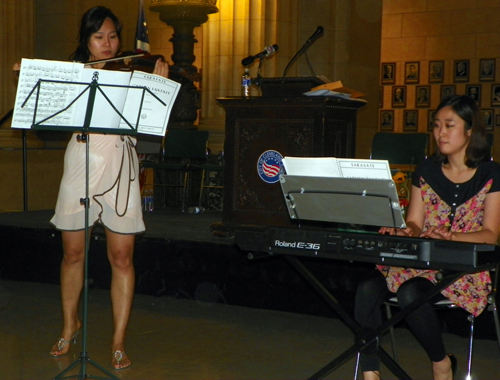 Two young ladies from the Korean American Association of Greater Cleveland performed on violin and keyboards. See photos and video from their performance. 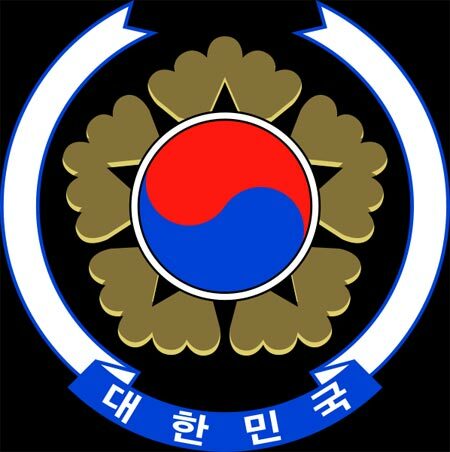 Submit your Cleveland Korean organizations and resources. 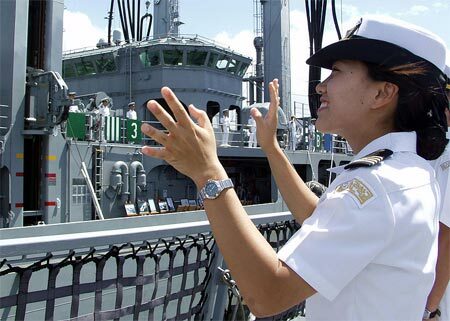 Submit your Cleveland Korean jobs, classes and other opportunities. Lieutenant Baldomero Lopez of the Marine Corps is shown scaling a seawall after landing on Red Beach (September 15). Minutes after this photo was taken, Lopez was killed after smothering a live grenade with his body. He was posthumously awarded the Medal of Honor. Sungnyemun or more commonly known as Namdaemun is a historic gate located in the heart of Seoul. The landmark is officially called Sungnyemun, literally "Gate of Exalted Ceremonies," but is widely known as Namdaemun, literally "Great Southern Gate." 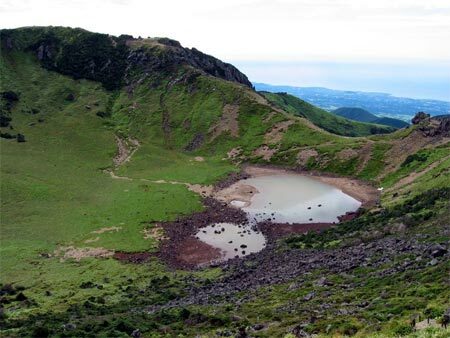 It is the first among the National Treasures of South Korea. 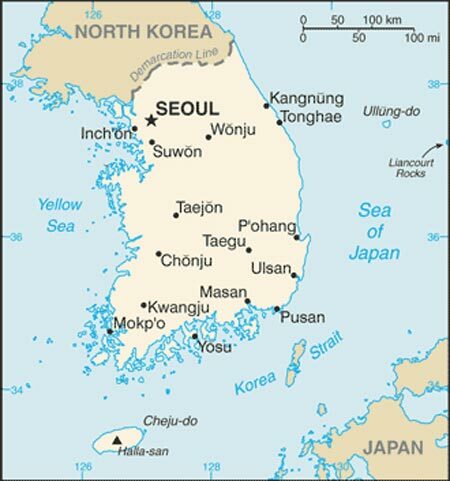 An independent Korean state or collection of states has existed almost continuously for several millennia. Between its initial unification in the 7th century - from three predecessor Korean states - until the 20th century, Korea existed as a single independent country. In 1905, following the Russo-Japanese War, Korea became a protectorate of imperial Japan, and in 1910 it was annexed as a colony. 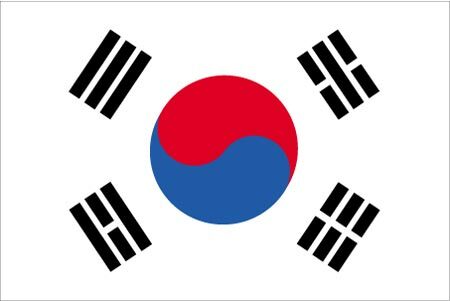 Korea regained its independence following Japan's surrender to the United States in 1945. 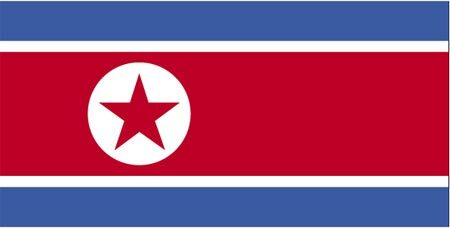 After World War II, a Republic of Korea (ROK) was set up in the southern half of the Korean Peninsula while a Communist-style government was installed in the north (the DPRK). 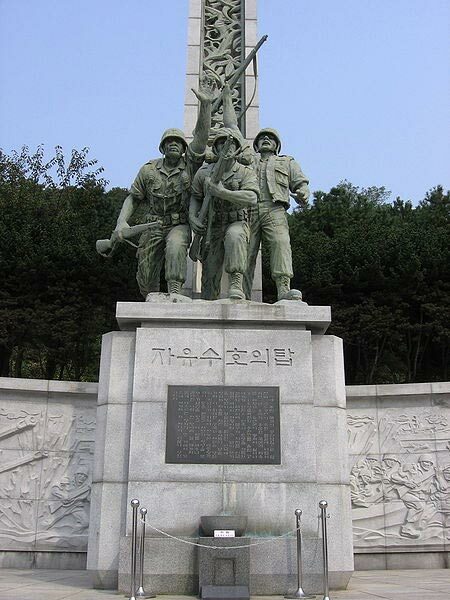 During the Korean War (1950-53), US troops and UN forces fought alongside soldiers from the ROK to defend South Korea from DPRK attacks supported by China and the Soviet Union. An armistice was signed in 1953, splitting the peninsula along a demilitarized zone at about the 38th parallel. 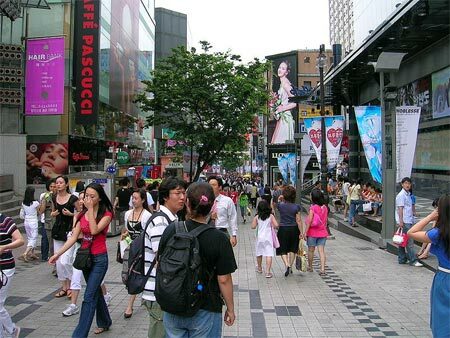 Thereafter, South Korea achieved rapid economic growth with per capita income rising to roughly 14 times the level of North Korea. In 1993, Kim Young-sam became South Korea's first civilian president following 32 years of military rule. South Korea today is a fully functioning modern democracy. In June 2000, a historic first North-South summit took place between the South's President Kim Dae-jung and the North's leader Kim Jong Il. In October 2007, a second North-South summit took place between the South's President Roh Moo-hyun and the North Korean leader. Harsh rhetoric and unwillingness by North Korea to engage with President Lee Myung-bak following his February 2008 inauguration has strained inter-Korean relations. A sculpture at the Incheon Landing Operation Memorial Hall. 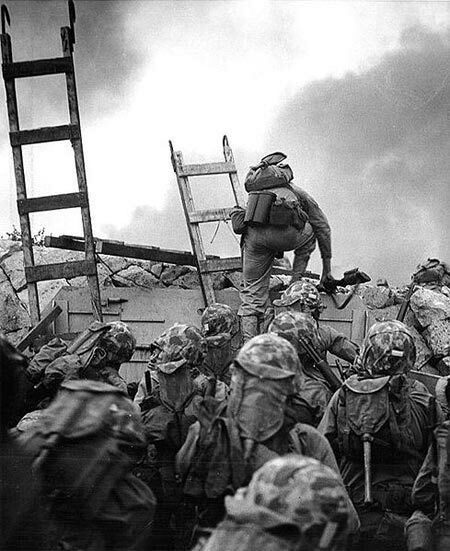 The Battle of Inchon (code name: Operation Chromite) was a decisive invasion and battle during the Korean War. An independent kingdom for much of its long history, Korea was occupied by Japan beginning in 1905 following the Russo-Japanese War. Five years later, Japan formally annexed the entire peninsula. 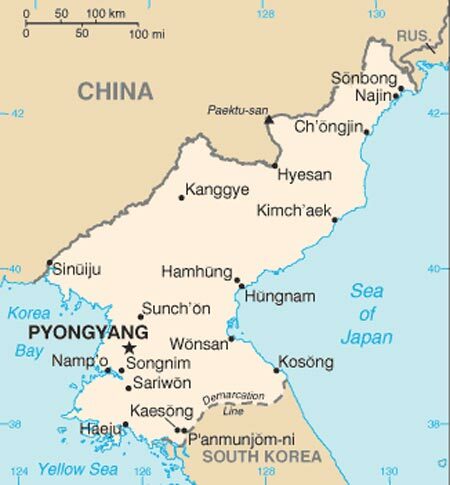 Following World War II, Korea was split with the northern half coming under Soviet-sponsored Communist control. After failing in the Korean War (1950-53) to conquer the US-backed Republic of Korea (ROK) in the southern portion by force, North Korea (DPRK), under its founder President KIM Il Sung, adopted a policy of ostensible diplomatic and economic "self-reliance" as a check against outside influence. The DPRK demonized the US as the ultimate threat to its social system through state-funded propaganda, and molded political, economic, and military policies around the core ideological objective of eventual unification of Korea under Pyongyang's control. Kim's son, the current ruler Kim Jong Il, was officially designated as his father's successor in 1980, assuming a growing political and managerial role until the elder Kim's death in 1994. After decades of economic mismanagement and resource misallocation, the DPRK since the mid-1990s has relied heavily on international aid to feed its population. North Korea's history of regional military provocations, proliferation of military-related items, and long-range missile development - as well as its WMD programs and massive conventional armed forces - are of major concern to the international community. In December 2002, following revelations that the DPRK was pursuing a nuclear weapons program based on enriched uranium in violation of a 1994 agreement with the US to freeze and ultimately dismantle its existing plutonium-based program, North Korea expelled monitors from the International Atomic Energy Agency (IAEA). 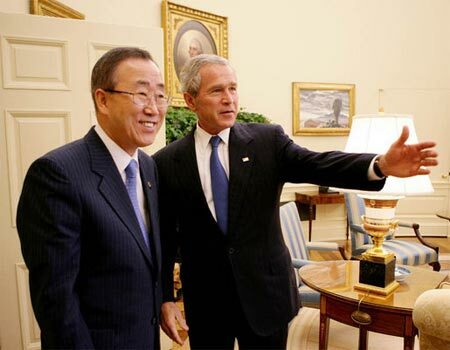 In January 2003, it declared its withdrawal from the international Non-Proliferation Treaty. In mid-2003 Pyongyang announced it had completed the reprocessing of spent nuclear fuel rods (to extract weapons-grade plutonium) and was developing a "nuclear deterrent." Beginning in August 2003, North Korea, China, Japan, Russia, South Korea, and the US have participated in the Six-Party Talks aimed at resolving the stalemate over the DPRK's nuclear programs. North Korea pulled out of the talks in November 2005. It test-fired ballistic missiles in July 2006 and conducted a nuclear test in October 2006. North Korea returned to the Six-Party Talks in December 2006 and subsequently signed two agreements on denuclearization. The 13 February 2007 Initial Actions Agreement led to the shut down of three of the North's nuclear facilities at Yongbyon in July 2007. In the 3 October 2007 Second Phase Actions Agreement, Pyongyang pledged to disable those three facilities and provide a correct and complete declaration of its nuclear programs by the end of the year. Under the supervision of US nuclear experts, North Korean personnel completed some of agreed-upon disablement actions at those three Yongbyon facilities by the end of 2007. North Korea began the discharge of spent fuel rods in December 2007 and provided a declaration of its nuclear program in June 2008. Tell us about the music, food, holidays, traditions, costumes, language and other qualities that make Koreans so special. Submit your Cleveland Korean cultural items. 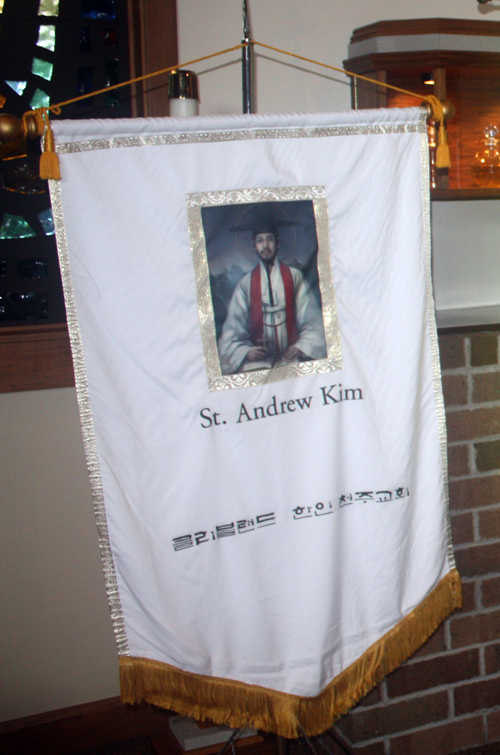 Sister Ann Patrick Adams, S.C.
South Korea's Kim Yu-Na, a world leading figure skater. If you are interested in being considered to be an official ClevelandPeople.com Ambassador to the Cleveland Korean community, please contact us. 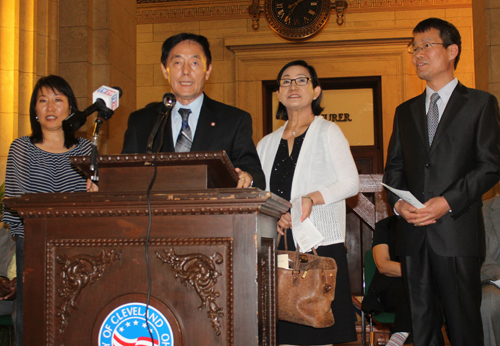 If you want to reach the Korean community in Cleveland and Northeast Ohio, please contact us.